Have you ever had the experience where you're so wrapped up in a situation that you almost forget everything about your life and are completely wrapped up in the situation? This can be a really neat experience or a really bad one. Like when your reading a really good book or when there is an event in your life that you completely fixate on and can't get over. Well, that happens almost every time I talk on the phone to my oldest sister, Kimberlee. She is an amazing story teller even when she isn't making one up. In her everyday conversations she manages to sweep me away with a story about how her family invented a story during church about two Unicorns trying to befriend an arsonist Unicorn, but they have a hard time doing it because all unicorns are bipolar and they have to go to therapy and the arsonist unicorn doesn't and that's why she is an arsonist. Seriously. That's how cool my sister and her family are (the story continues that the two unicorns try to divert the arsonist's arson tendencies by getting her a new hobby, like being in the illegal gun black market). After hearing all about these mystical unicorns and the illegal black market, Kimberlee continued by telling me about one of the best ideas she has come up with as a mother for her children. 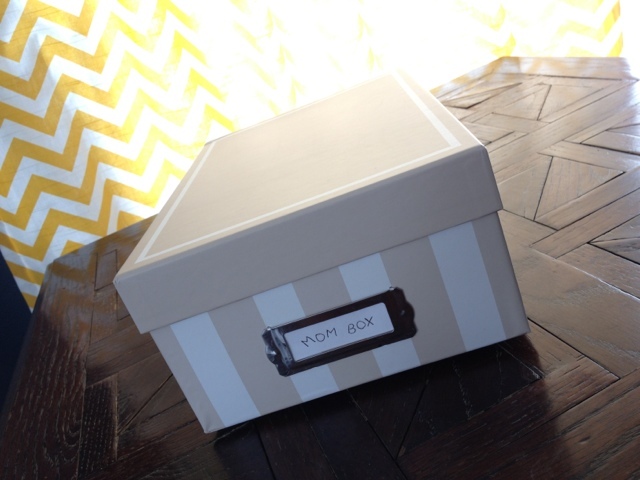 This is a Mom Box (only cost me $1.75 at Michael's). 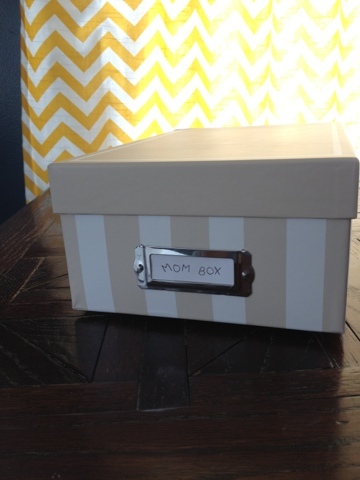 With a function much like a mailbox, it provides a means of correspondence between Kimberlee and her children. Every day she will leave a on inspirational quote or just a little love note with a treat for her children. 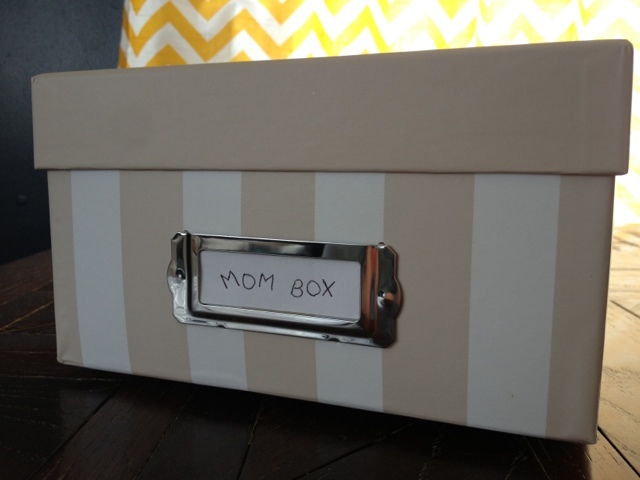 The older kids even have a second box underneath the first where she they will write only positive things, like their lifelong goals or dreams. This helps them with their self-image and I think helps them keep a lifelong perspective because it can be so easy to fixate on predicaments now that may not really be that important in the long-run. I absolutely love this idea, but with only a 10-month-old, it's not exactly the perfect idea for me, so I've made a little adjustment. Every day (alright, maybe not everyday, but at least once a week), I will write something down that Chelsea did that was cute or funny and save it in the Mom Box, and when she gets older, she can read through them, and the box will gradually change over time as she grows older and situations change. I think this will become a really special bonding experience for me and my daughter as well as a sweet reminder of what a good, sweet person Chelsea is. What a blessing it is to be a mother! I want to share one more thing that my sister said. She was blessed with many talents. She plays the violin beautifully, writes amazingly, runs, and is so creative. But there are enough concert violinists in the world. There are enough writers, runners, and creative geniuses. What there aren't enough of are good mothers. I am so glad that I have been willing to give up "the big time" to give my talents to my family. This is not to say, "give up on your dreams and talents," (that's why I love blogging so much, because it provides an outlet for me to share with others my ideas and talents). It's more to say that being a mother is the most rewarding thing you can do, and I'm glad that I made that choice. What about you? I love this idea , being so busy I stopped writing in my Memory books ! !